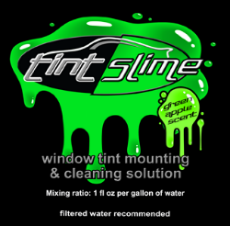 Keeping the dreaded dust specks out of your tint jobs is something you will learn to fight for quite a while once you start out on your car window tinting journey, and before I get the hot shots shouting up that they never get contamination in their installations I will call BS on that! Keeping your work ultra clean is not as easy task, and the expectations of your customer will play a big part in how your work is received. Some customers will expect perfection, and may return a car because it has maybe one or two microscopic dust specks in the window, the others will look at the car from 12 feet away and give a smile.."looks awesome man!" And that's how it goes, I have looked at plenty of people showing off on YouTube, slapping film on really fast, but trust me..their work will never be as clean as the guy who takes the extra time and steps needed to make the job as clean as is physically possible. Starting with your slip mixture, this is a key factor in delivering top notch results, don't use water straight from the tap, its full of crap that you can't see but will show in your car window tinting work. This is the starting point in controlling contamination, at the very least, purchase some filtered water as this will also help reduce contaminants. Next time I will update you on the most effective glass preparation methods prior to window film installation.